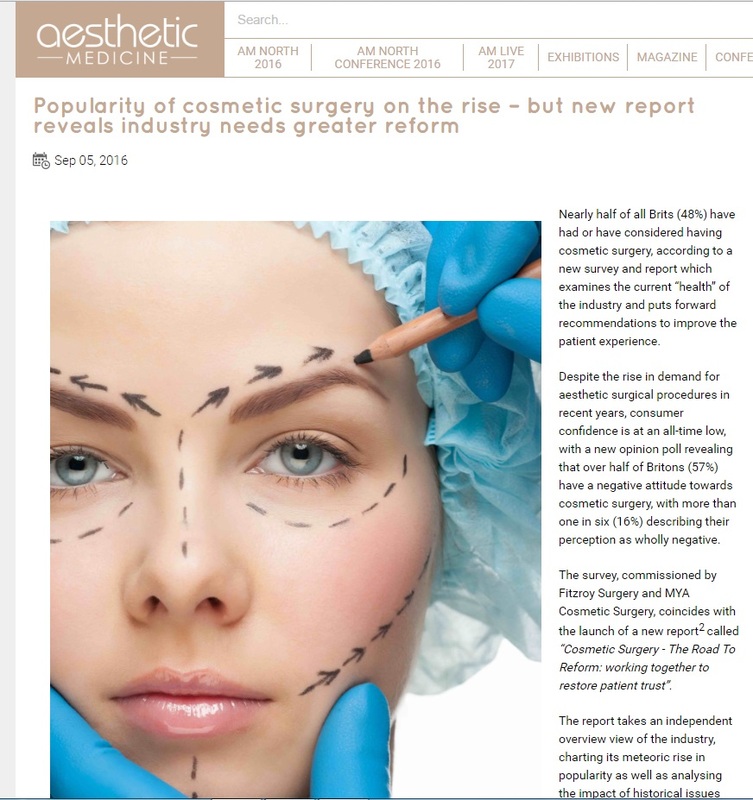 Fitzroy Surgery and MYA Cosmetic Surgery have published a new report entitled “Cosmetic Surgery – The Road To Reform: working together to restore patient trust”. The report takes an independent overview of the industry, charting its rise in popularity as well as analysing the impact of historical issues such as the PIP breast implant scandal. 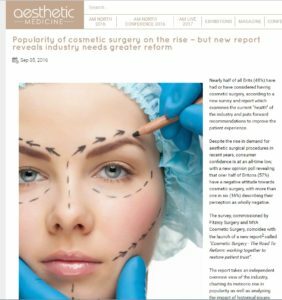 The research explores some of the reasons why cosmetic surgery has been on the rise although consumer confidence is at an all-time low. Over half of Britons (57%) have a negative attitude towards cosmetic surgery, with over 1 in 6 (16%) describing their perception as wholly negative. The main reason Brits have had or have considered cosmetic surgery is to increase body confidence and self-esteem – with twice as many women (33%) compared to men (16%) admitting this. 9 in 10 (92%) don’t think that celebrities are always honest about cosmetic surgery. Nearly a quarter of Brits (24%) said that a celebrity would influence their decision to have cosmetic surgery. However, younger people are more likely to be swayed – with 44% of 16-24 year olds and 46% of 25-34 year olds – saying a celebrity would influence their decision to have surgery. These findings conclude that although there are many examples of best practice, with excellent surgeons and providers, as well as the introductions of new regulations, there are still gaps in the provision of patient care and a need for greater scrutiny and continues reform to restore patient confidence and enable consumers to make informed choices about their providers and treatment options. Unsurprisingly the report is already gaining a lot of interest. Such as this fantastic piece in Aesthetic Medicine.